A pulsar is a highly magnetised neutron star, with a radius of 10-15 km, having somewhat greater mass than the Sun which has a radius of approximately 1 million km. Radiation is beamed out along the magnetic poles and pulses of radiation are received as the beam crosses the Earth, in the same manner as the beam from a lighthouse causes flashes. Being enormous cosmic flywheels with a tick attached, they make some of the best clocks known to mankind. The sounds on this web page directly correspond to the radio-waves emitted by the brightest pulsars in the sky as received by some of the largest radio telescopes in the world. To listen to the pulses of a radio pulsar, click on the sound icons below. Click on the movie icons to see visualisations of the signals. When you listen to the sounds of pulsars, imagine these objects which are half a million Earth masses whizzing around! See here for a list of useful other resources of information. Some answers to common questions can be found below. Other pulsar sounds can be found on the webpage of the Dutch pulsar group. 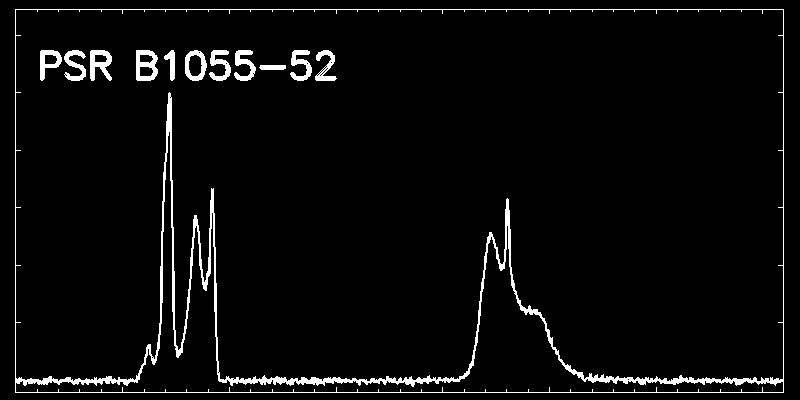 0.714520 sec (or 1.40 Hz) ~5.5 million year old This is the brightest radio pulsar in the northern sky. 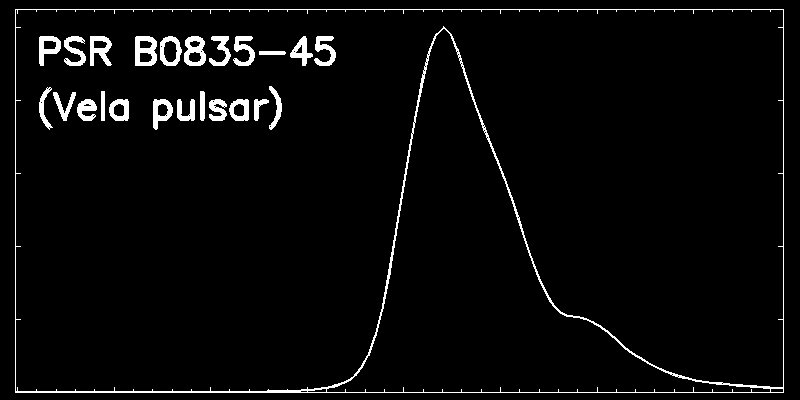 Otherwise this pulsar is a typical, normal pulsar, rotating with a period of 0.714520 seconds, hence the star makes about one and a half turn in a second, giving it a locomotive kind of sound. You can hear and see that each pulse has a different structure, hence the beam of this cosmic lighthouse is constantly changing in shape. This recording has been made with the Lovell telescope in Jodrell Bank. 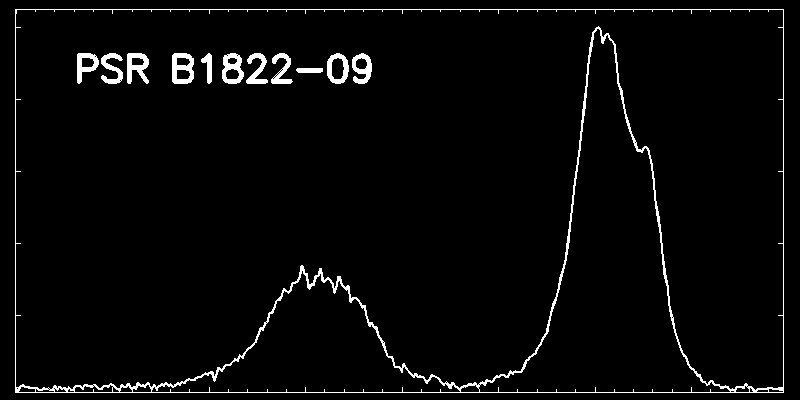 0.769006 sec (or 1.30 Hz) ~200,000 years old This pulsar has a similar rotation period as the pulsar above. A difference is that halfway through the recording much more of the pulses have become single-peaked rather than double-peaked. This is because of a so-called "mode-change". For this pulsar the properties of the lighthouse beam can be in two distinctly different states. This recording has been made with the Lovell telescope in Jodrell Bank. 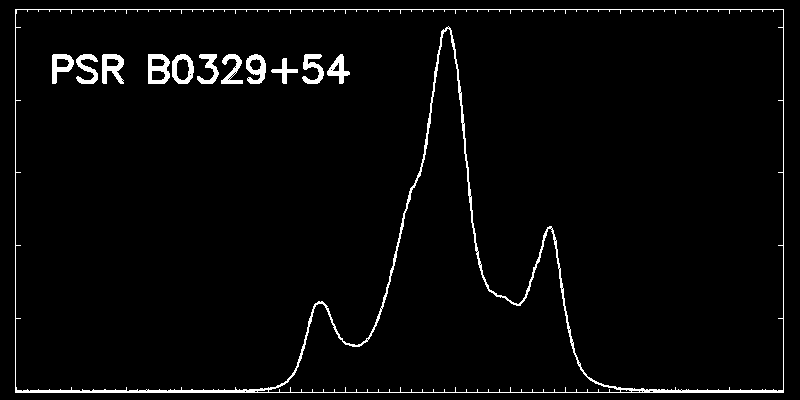 0.358738 sec (or 2.79 Hz) ~900,000 years old This is the live data of pulsar B1933+16 used in "Sky At Night" which was broadcast on BBC 4 on March the 9th 2014 at 22:00. 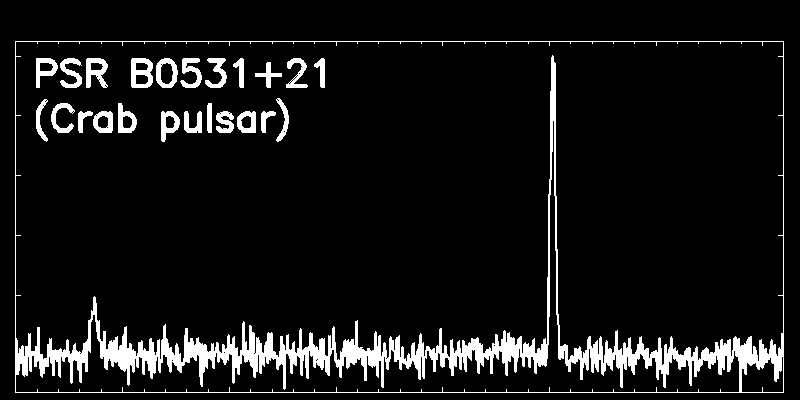 During the recording the telescope moves towards the pulsar and after six seconds the heartbeat-like pulsar signal is being received. This recording has been made with the Lovell telescope in Jodrell Bank. 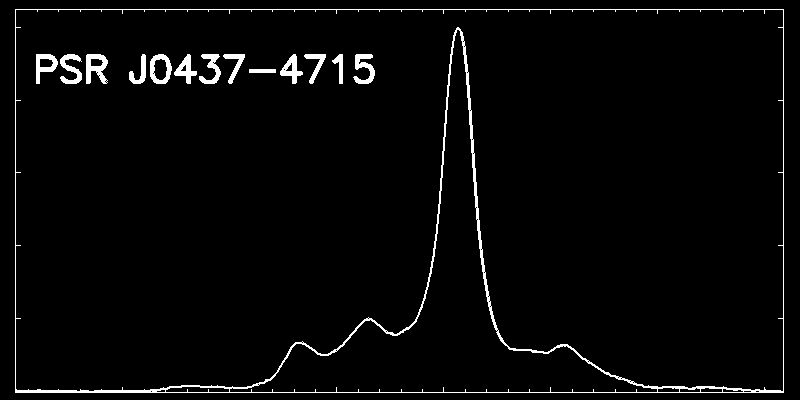 0.197108 sec (or 5.07 Hz) ~500,000 years old This is an example of a more complex pulsar signal. This pulsar is oriented such that we can observe both opposite magnetic poles, resulting in a main and interpulse for each rotation. The pulsar rotates every 0.197 seconds, but every 0.1 seconds a pulse is observed. To complicate things further, the interpulses get weaker and stronger every 20 rotations or so, creating a nice beat as you can hear. This recording has been made with the Parkes radio telescope in Australia. Not available 0.089328 sec (or 11.2 Hz) ~10,000 years old This pulsar lies near the centre of the Vela supernova remnant, which is the debris of the explosion of a massive star about 10,000 years ago. The pulsar (a so-called neutron star) is the collapsed core of this star, rotating with a period of 89 milliseconds or about 11 times a second. This recording has been made with the Parkes radio telescope in Australia. Not available 0.033045 sec (or 30.3 Hz) Born in 1054 A.D. The Crab pulsar is the youngest known pulsar. It lies at the centre of the Crab Nebula, the supernova remnant of its birth explosion, which was witnessed by Europeans and Chinese in the year 1054 A.D. as a day-time light in the sky. The pulsar rotates about 30 times a second, however for most rotations no radio waves are detected. But every now and then a pulse is detectable which can be extremely strong and therefore called "giant pulses". Among weaker ones, the strongest giant pulse in this recording occurs close to the end. This recording has been made with the Lovell telescope in Jodrell Bank. Not available 0.005757 sec (or 173.7 Hz) Very old This is the brightest so-called milli-second pulsar known. 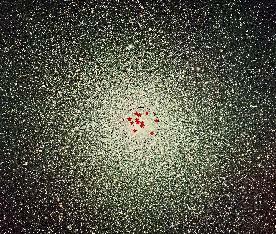 This old pulsar has been spun up by the accretion of material from a binary companion star as it expands in its red giant phase. The accretion process results in orbital angular momentum of the companion star being converted to rotational angular momentum of the neutron star, which is now rotating about 174 times a second. It spins so fast that the signal sounds like an overactive bumble-bee. This recording has been made with the Parkes radio telescope in Australia. What do I see in the movies? The signal (hence the audio) is the same in both types of movies. The first movie shows what is sometimes called the pulse train: it shows how the radio intensity recorded by the radio telescope (vertical axis) changes over time (horizontal axis). Pulses are visible at regular intervals corresponding to the beam of the pulsar sweeping over Earth for each rotation. The signal in the second movie is the same, but it is chopped into pieces with a length equal to the rotation period of the star (each containing one pulse). Instead of drawing these pieces next to each other, the pieces are drawn above each other. The audio you hear is that of the pulse indicated with the red horizontal line. The previous pulse you heard is the pulse below and the next pulse you will hear is above the red line. The time during a pulse (horizontal axis) is displayed in degrees, where 360 degrees correspond to a full rotation. To allow the structure of the pulses to be seen, the graph is zoomed in such that only part of the 360 degrees is visible. How are the sounds created? The radio waves we receive from pulsars are electromagnetic waves, so very similar to light, not sound. A radio telescope operates at some level similar to a radio: it records the radio waves and it can be used to make sound out of the recorded signals. Similar to radios, which can for instance use AM or FM, there are different ways in which this can be done. The sounds on this web page essentially use the intensity of the recorded radio waves as the amplitude of the produced audio waves. In some cases an audio filter was applied to somewhat suppress the white noise to better bring out the sound of the pulsar. Why is the sampling rate not 44.1 kHz? "CD quality" sound, which is sampled with 44.1 kHz, will not result in the clearest sound for a pulsar. The finer the sampling, the less signal there is in each sample. If you make the sampling rate too high, the noise (caused for instance by the thermal motion of electrons in the antenna of the radio telescope) will dominate over the very weak radio signal of the pulsar. As a consequence the signal will sound weaker or will even disappear in the white background noise. In many cases the true sampling time used in the pulsar recording is even lower than that of the audio file, because most software/hardware will refuse to play the audio file if the sampling rate is too small. Is there any need to correct for "dispersion"? Unlike a normal radio, a radio telescope will not tune in to a specific radio frequency. Using a wider bandwidth will mean that more signal can be collected, allowing the detection of weaker signals. Space is not a perfect vacuum, and therefore the propagation velocity (speed of light) of the radio waves will be different for different radio frequencies. This effect (called dispersion) means that the pulses from pulsars arrive at slightly different times depending on the frequency of the radio waves. In order to make use of a wide range of frequencies, a different frequency-dependent delay has been added to the recording of the pulsar signal to correct for this effect. I want to use these (or similar) sounds in an art project. Who should I contact? 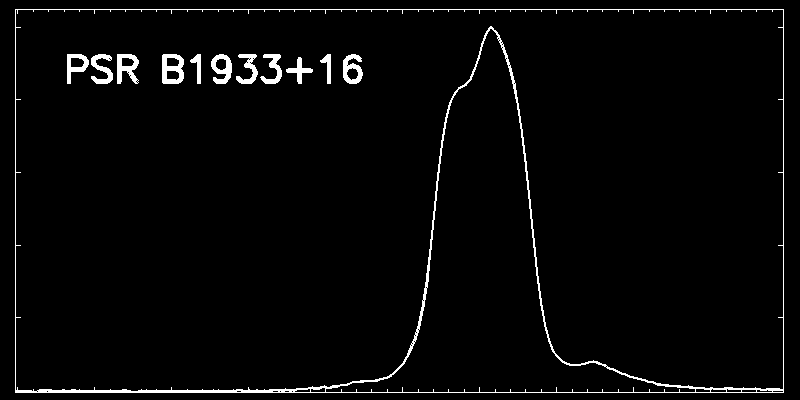 PSR B1937+21 is the second fastest known pulsar, rotating with a period of 0.00155780644887275 seconds, or about 642 times a second. The surface of this star is moving at about 1/7 of the velocity of light and illustrates the enormous gravitational forces which prevent it flying apart due to the immense centrifugal forces. The fastest-rotating pulsar is PSR J1748-2446ad, which rotates about 10% faster at 716 times a second. This pulsar is too weak to be used directly to make a pulsar sound. But with better future radio telescopes its sound will be like this. This is a sequence of 16 of the known millisecond pulsars followed by them all played together. This is a sequence of the pulsar sounds as they fade due to intensity variation caused by interstellar scintillation.